Most people love getting Christmas cards in the mail. For collectors, there is another type of Christmas card to chase -- Christmas trading cards. For those who are strictly into sports cards, there are several options. Collectors who want to expand their horizons a little more will find many more if they venture into the entertainment and non-sport side of the hobby. Here are ten such sets that touch on Christmas traditions, holiday classics and other parts of the season. This is not an exhaustive list, but there should be enough here to get you in the hobby holiday spirit. 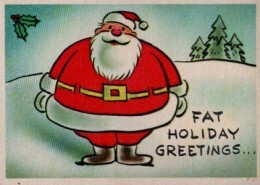 Part trading card, part Christmas card, 1960 Fleer Yule Laff features cartoon sight gags and plenty of puns. In 1959, Topps released their Funny Valentines set, which carried a similar tone, obviously themed for a different holiday. While 1959 Topps Funny Valentines remains a hobby classic, 1960 Fleer Yule Laff failed to gain the same mainstream notoriety. Today, the 66-card set remains relatively affordable and not too hard to find. 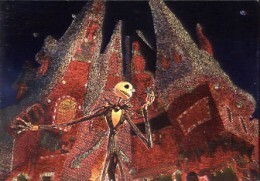 It took several years for Tim Burton'sThe Nightmare Before Christmas to build its popularity. Now, the movie has had several sets, but the first came out at the time of its original release. 1993 SkyBox Nightmare Before Christmas has a 90-card base set that includes story and character cards as well as some that look at the making of the film. Etched-foil Spectra cards are the only inserts. They fall two per box with the set consisting of four cards. In 2001, NECA released a set for the film that is most notable for its autographs. Signers include Tim Burton, composer Danny Elfman and actors Chris Sarandon and Glenn Shadix. 1994 TCM Santa Around the World is a historically based set that looks at how Santa is celebrated in different parts of the globe. The 72-card base set features different artistic interpretations. 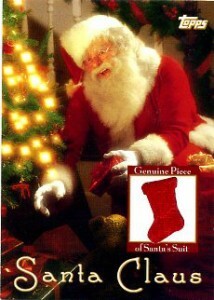 Inserts include a dozen Santa Foil cards and a 22 carat gold card. And, because it was the mid-90s, collectors can also find prepaid phone cards. The company released a similarly themed set the following year called Santa and the Snowflakes. 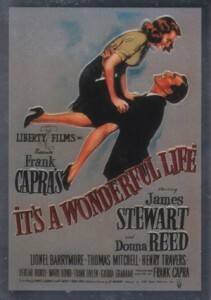 Frank Capra's It's a Wonderful Life is one of the most beloved holiday films of all-time. The mid-90s trading card set? Not so memorable. The 72-card base set does a good job of recapping the movie. Six Chromium inserts add a little modern flair. A redemption for a Talking Card. Because DuoCards is out of business, don't expect to redeem one if you find one. Although 2000 Dynamic Forces Grinch set focuses mainly on the live-action movie starring Jim Carrey, it also combines elements of the book and the classic animated special. Available in both hobby and retail versions, the base set has 99 cards. The majority have movie images on the front, although some have illustrations. Inserts are highlighted by a large list of autographs. Most of these are names you may not have heard of before. Twelve animators who worked on the cartoon signed base cards, which fell about one per hobby box. Also, actors Jeffery Tambor and Christine Baranski, and director Ron Howard, have their own autograph cards. 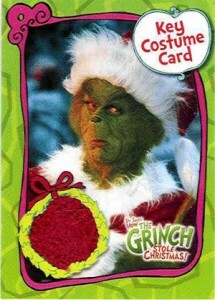 The set also has a handful of costume cards with swatches from a Grinch Santa suit. Given the names involved and lasting popularity of the movie, these cards could be seen as a bargain. In particular, costume cards can be found for well under $20. 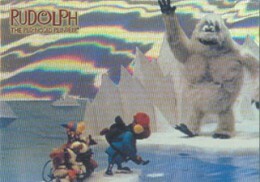 2001 Dart Flipcards Rudolph the Red-Nosed Reindeer is a set that sort of exists. While the now-defunct company planned a full-fledged release, they ended cancelling it. They did, however, sell off sets of chase cards. Each has nine Holofoil Movie Reel cards from the CG sequel and six Holofoil cards with characters from the original classic. Sealed mini sets also have a sketch card. In 2003 and 2004, Upper Deck's Disney Treasures line produced some of the best trading cards to date to feature Mickey Mouse and his friends. 2004 Upper Deck Disney Holiday Treasures is a 50-card set that includes subsets for Christmas-themed cartoons, holiday postcards and princesses dressed in holiday clothes. Ultra-rare sketch cards are the only inserts. 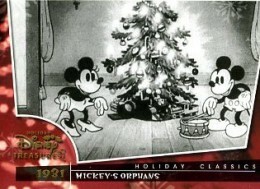 2004 Upper Deck Disney Holiday Treasures came packaged in five-pack blaster-style boxes. They also came with a pair of Mickey and Minnie Mouse figures. 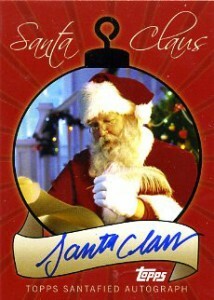 2007 Topps Santa Claus is a cheap box set that comes with 16 base cards. 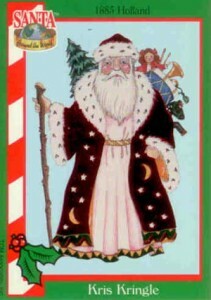 They feature St. Nick on various Topps Baseball designs between 1952 and 2007. Sets also come with an autograph and a Santa suit relic. Available for well under $20, it makes for some cheap hobby humor. In what would become one of the final Inkworks sets, the company released a small box set based on the sci-fi show's holiday-themed season three episode. Every set comes with seven foil base cards and one of two costume cards. Sets are numbered to 2,500 copies. While not the biggest following, Supernatural fans were very supportive of the card line. As a result, these sets still move well today. For several years now, Benchwarmer has been producing holiday-themed sets. Like all of the company's sets, they're a modern equivalent to pinups. Cards feature beautiful women in skimpy clothes. For these sets, it's mostly red and green lingerie and bikinis. The chase is led by autographs, model-worn clothing and kiss cards. 2017 UNIVERSAL HOW THE GRINCH STOLE CHRISTMAS BEAUTIFUL PROMO CARD 4" X 6"
Wait, we’re talking lasting popularity of animated Grinch right? Cuz the live action one is rubbish, to be generous. lonestarr � Personally, I would say the film is far worse than rubbish (torture,spoons and eyeballs are the three words that come to mind) but it’s also tough to deny its popularity with the masses. What about that Santa card from 1990 Pro Set football? I know this is about sets and that was a special insert, not a set. Looking back, not sure why I didn’t have the ProSet Santas listed. There was probably a reason (possibly they need a piece all to their own) but I’m a year older and forget things. FACTORY 2007 Topps Santa Claus Holiday Edition. Sealed Box Set. PLEASE LOOK!! !